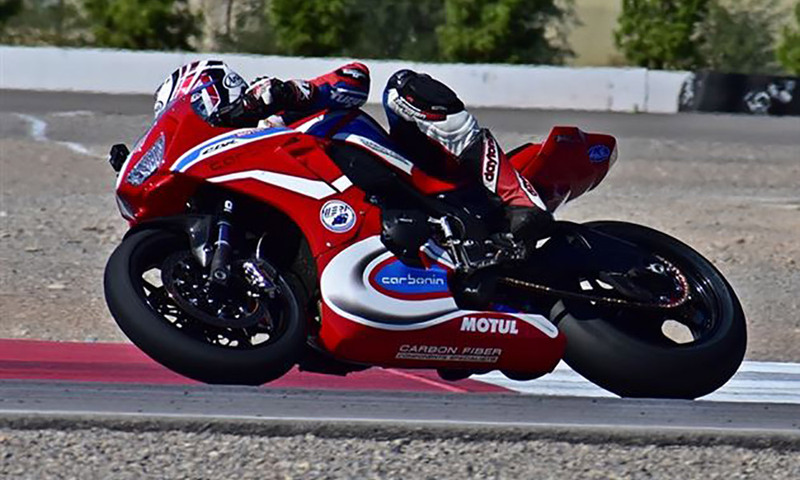 Reproduced courtesy of Roadacing World Publishing, Inc.
MotoAmerica competitors Jayson Uribe and David “Aussie Dave” Anthony split the Formula One wins at the WERA West Presented by Lucas Oil Products season-ending doubleheader on the 1.8-mile Las Vegas Motor Speedway Classic Course. Uribe, who competed in Europe for the past several seasons, found himself without a ride for 2018, but filled in on the Genuine Broaster Chicken Honda CBR1000RR team for three MotoAmerica rounds this season. On a Motul-backed, Dunlop-shod Honda CBR1000RR, Uribe took a clean win in Formula One on Saturday over Justin Simons on a Kawasaki ZX-10R and Louis Jutras on a BMW S1000RR. Uribe backed it up with a victory in the A Superbike race over Simons and Aaron Ascher on an Aprilia RSV4. On Sunday, Anthony pulled in to the paddock with the big ADR Motorsports/FLY Street rig, which had just rolled back to the West from the final MotoAmerica round of the season at Barber Motorsports Park in Alabama. Anthony started the day on his Dunlop-shod Kawasaki ZX-10R with the A Superstock win over Simons and Jeremy Simmons on a Yamaha YZF-R1. Simons would get his revenge at the end of the day, edging Anthony by less than a second for the A Superbike victory, with Ascher again third. In between, Anthony had to battle hard to keep Uribe behind him during the six-lap Formula One race, with Anthony’s Kawasaki crossing the line 1.631 seconds ahead of Uribe’s Honda. Uribe, however, did the only lap of the weekend in the 1:16 bracket, turning a 1:16.983 while chasing Anthony.